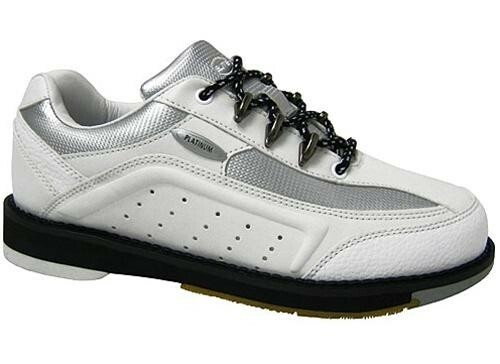 Don't miss out on these stylish Elite Women's Platinum Right Hand White/Silver bowling shoes! Elite offers a 2 year warranty with these beauties! I am extremely satisfied with my purchase! I have very wide feet and a short heel so buying and wearing shoes has never been enjoyable for me. But these shoes are so comfortable! This is a ten-out-of-ten for me. By Bowler297 from Eureka, Mo. Use the shoes everytime I bowl. Very light on the feet. I use these shoes for league and tournaments. They are GREAT! They are very comfortable. They are a good width, and they slide great! I would recomend theses shoes to any bowler! Great shoes! They are comfortable,light weight and they look great. Highly recommend. I am a regular league bowler and i love my new bowling shoes. Very flexible and very well fitting. I wish that they were made with a better shoe lace eye holes. U cant tighten them up to much at one time for u will pull out the shoe lace eye holes. In which its a quick and easy pop back in type of a fix nothing major. But with this little con i would still recomend these shoes to others there so great in manys ways. This is the first pair of bowling shoes I have purchased in over 20 years as I just joined a league again. I was afraid to buy online as you can't try them on. I took a leap and ordered them based on their appearance. After I broke them in a few times, they are very comfortable and I am very happy with my new purchase! I would recommend these to any beginner. Someone more advanced may not like them. The brackets that the laces go into have pulled out of my shoes and can't be fixed. I will have to send the shoes back and get a different pair. I really liked these shoes too. I am just a so-so bowler and shoes do not really make a difference in my scores, but at a Size 5, these are the cutest shoes in the bowling alley! . Just want to know if the Elite shoe runs true to size or do I need to have a size bigger? I wear a Woman's 8. Generally the feedback we get for these shoes is that they run true to size, but we cannot guarantee this. What this shoe work for a bowler who drags right foot behind while at spproach? Great question! This will be a good shoe for a bowler who drags their foot because of the fixed soles that will not peel back. Hello Ann! No, the soles are not the same. The right shoe will have a traction sole and the left show will have a slide sole. Do you have this shoe in Black? Unfortunately, we do not offer this shoe in black. Hello AK. These will be fixed soles with a traction sole on the right foot and a slide sole on the left. These shoes are not interchangeable. They are a man made upper. Do these shoes not come universal sole. These will be for a Right Handed bowler only. There will be a slide sole on the left foot and a push off sole for the right foot. Due to the time it takes to produce the Elite Womens Platinum Right Hand White/Silver ball it will ship in immediately. We cannot ship this ball outside the United States.